The other day, Adunni my trusty iPad bought me Roses and Bullets, Akachi Adimora-Ezeigbo’s new book on the Nigerian civil war. I don’t know, iPads should not be this powerful; Adunni has unfettered access to my bank account and she is always buying me books off the Internet. I wish she would buy me books that engage and entertain me like a good bottle of cognac VSOP. I won’t lie, reading Adimora-Ezeigbo’s latest offering was pure torture. The book sent me to sleep each time I opened it on Adunni’s Kindle. I stopped reading it halfway; I won’t be back to it. Life is too short to be miserable. I tried, I really did, but I could not get past the clinical aridity of this book. This is one deadly boring book. Reading it makes watching paint dry an exhilarating experience. Why did I stop reading the book? Well, it reads like a neatly typed, fastidiously edited memorandum penned by a humorless civil servant who is used to writing government white papers for the Kremlin. It is relentlessly edited, stripped of every conceivable emotion, with every joy of reading wrung and bleached out of every word until the reader’s eyes beg for sleep – or death. This book should be an instrument of torture in police stations. The victim will confess to an imaginary crime just to be allowed to rest. I kept rubbing my eyes and falling asleep. All insomniacs should skip Valium and buy this book; they will be cured. This tome is borne on stilted clinical prose, a meandering tale that seems reluctant to make a point, any point. Why was this book written? What new insights does it offer on the Nigerian civil war? How does this book improve upon the silence? Other than it is about the Nigerian civil war, I have no idea what the reader should take away from this book. The clinical antiseptic prose violently strips the novel of ambiance or atmosphere. I could not imagine Biafra; I could not imagine Nigeria, not with this book. Not even the mention of Kingsway Supermarket could drag me back to those years. Any writer worth his or her salt should be able to describe the unique smell of Kingsway and bring tears to the eyes of memory. The Nigerian civil war was a unique era, a sad time in our history that requires an expert hand to capture the sights, smells, and songs of that horrid period. This plodding overweight non-story suffers from a poor design, well, actually from no design; it does not lay the context for the story and anyone new to the horrors of Biafra is well advised to go elsewhere first. There is no over-arching vision, and the characters are so inchoate and forgettable, I cannot remember any of them, can’t tell them apart. And this brings me to my pet peeve. Adimora-Ezeigbo goes to great lengths to italicize and explain indigenous terms like ikpi nku, chinchin, ube, udara, etc, I imagine in a bid to reach and keep a wider audience beyond her clan. I have a huge problem with this habit among African writers. They all need a healthy dose of self-confidence. In their works they are always italicizing egusi and ugali. I say, tell your story; stop italicizing our way of life. Let the reader do the research. Besides that is what Google is for. I have never seen sauerkraut in italics. The Nigerian Civil War is a hugely important topic and it is a crying shame that many Nigerians have no idea of the enormity of that horror that visited us. A search on “Nigeria Biafra” on amazon.com yielded hundreds of hits. Chimamanda Adichie’s Half of a Yellow Sun is a good book for those who want to read everything about what Roses and Bullets is not about. I have a review of it here. There are many contentious issues that Adichie brings up – and there is no shortage of robust debate about them. That is what a book should do. Dan Obi Auduche also has a helpful bibliography of eighty books on the Biafran war here. Adichie’s book has a helpful reference list of thirty books. Where Awduche’s list is focused on books directly about the war, Adichie’s has a broader focus. Virtually all the books directly on the war on Adichie’s list are also on Awduche’s list. It would have been helpful to see the reference list Adimora-Ezeigbo drew upon for her research. My favorite essay on Biafra by the way is My Biafran Eyes by Okey Ndibe, that irrepressible owner of words. You may feast on it freely on Guernica here. “The Last Duty” by Isidore Okpewo. Caught a portrait of the psyche in a time of war through love, greed. I love the way he wove his satire with threads of sharp wit and humour. Highly recommended. Couldn’t get past the first two pages. Disappointing stuff, really. Akachi is a poor writer, simple! Her books are an example of how NOT to write. My Kindle doesn’t have a name, but when it refused to buy this book for me, I was wondering why. Now I know. I wish my Kindle hadn’t purchased this for me – dangerous things those Kindles with access to our bank aren’t they? Sounds excruciating, making me wonder how it is shortlisted for the ANA Ken Saro Wiwa Prize for Prose? Really makes me distrust Nigerian prize lists! You might like Elechi Amadi ”Sunset in Biafra” and Chukwuemeka Ike’s ” Sunset at dawn”. You might also find a few stories( ”Girls at War”, ”Sugar Baby”, and ”Civil Peace”) in Achebe’s ”Girls at War” stimulating. Isn’t it dangerous reading only half of a novel and saying so much about it?Your literary tastes must be quite strange if you expect a war novel to be humorous.The war front is not a stand-up comedy show. If you don’t have the patience to follow demonstrations of how wars can destroy hope, love and what you call ’emotions’, just too bad. Many great novels begin slowly. There is a book scheduled to come out of the press in 2012: News of a Forgotten War by Ike Okonta. It promises to deliver. “No writer writes in vacuum” As a learner, i think that Akachi Ezeigbo has been able create an impression of what the Nigerian civil war was like in her ” Roses and Bullets” because then, i was’nt born. I love the way she presented the main character, Ginika. It was really a tragic event for Ginika who went through tough times, especially at the end of the war when she lost her brother and husband all at once. I feel that the word “ROSES” in the title symbolises Love while the word “BULLETS” symbolises War, that is the book is a combination of love and war. I wish i could be inspired to write like her because i enjoyed reading the book even though it was voluminous. She’s a wonderful writer. What do they say, ‘different strokes for different folks.’ Strange really how some so-called critics base their decisions about a work on other people’s opinions. Chimamanda’s Half of a Yellow Sun is so celebrated because of her endorsement by foreign prize givers who set the criteria for what good literature in Africa is. Or else, it does contain nothing that makes Roses and Bullets a bore. Let’s always have the patience to go through works we hope to comment on instead of manifesting the Pull Him Down syndrome that is inhabiting us. Have you misinformed yourself or someone has? To say that “Chimamanda’s Half of a Yellow Sun is so celebrated because of her endorsement by foreign prize givers” endorses you for a differnt stroke..I mean serious strokes. Have you read the first page of that book? The first paragraph…the line. You journey through every word, on your own. Unique. Half of a Yellow Sun and Roses and Bullet have been written upon the same context, but their construct and content presentation just differ. Adiche does better at telling the civil war story. But then ‘different strokes for different folks’. I have not Read Roses and Bullets, but I have done some researches into the Biafra plight. Such materials as available at that time give me the confident that whoever care to read can reconstruct the Whole Biafra Story, ground up. I can too. Such fictions as Adichie’s work would only help in calling to mind sight, sound and smell of Biafra. I also think Ezeigbo’s Roses And Bullets, however sterile its appeal might be to you, dear Pa, will succeed in that regard. And thanks for sharing your thoughts with us. But I still have to read it, if not for the benefits you suggested, for sheer reason of getting to the heart of the matter of your rant. I hope you feel better now, sir. I’ve read both novels: Adichie’s and Ezeigbo’s; cover to cover. And not just read; studied. You do not give any critical parameters that guide your slant of commentary. Novels are not read for the fun of imageries and past-times; they embody a careful naturalistic re-living of either exciting or unexciting times. But you are not patient enough to wait by and hear the sound of boiling steam. Roses and Bullets was written under a different slash of individual circumstance and authorial motivation from Adichie and you lack the jurisprudence to complain about an unfinished reading. If you think novels that “sent me to sleep each time I opened it” are consequently not good enough, you should be reading Hardley Chase more often. I wonder what you would say when you read Soyinka’s The Road or Bessie Head’s A Question of Power – yet these are powerful literary references. Really it takes a literary expert to determine what is a good read novel or not, not just some myopic narrow-minded cynics.Henry James said the best novels are those written from writers’ experiences.Roses and Bullets is a recapitulation of Akachi Ezeigbo’s experience in the Biafra War. Wow,if you can complain this much about Roses and Bullets then don’t ever read Children of the eagle by the same author or any of her previous works please. 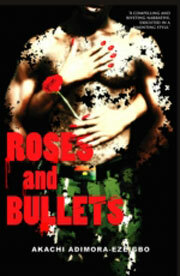 Roses and bullets is actually the best she has ever written her other books are awful. She draggs unnecessary details. I had to study one of her books in school and I almost cried,it was the worst punishment ever,only a handful of people actually finished reading the book in a class of over a hundred people. I simply don’t understand how she wins any awards with her books really. me hanging unto every word.